A paper Christmas wreath can easily have lights added to it creating a lovely glow around the wreath. 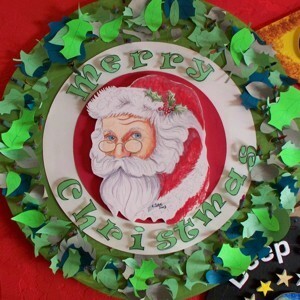 Learn how to make a lighted paper Christmas wreath that can be used as a decoration or a gift. Wreath made of cardboard, Styrofoam, colored paper and mini Christmas tree lights. Cut 24 inch diameter circle out of the cardboard. Paint Christmas green and let dry. Paint Santa on either Styrofoam or corrugated cardboard. 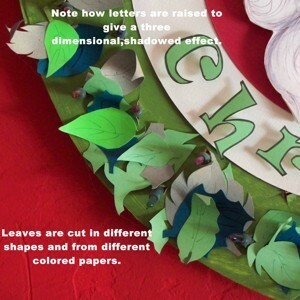 Make lots of leaves by cutting out of green papers. Shape is not that important, just make several concave cuts around a piece of green paper. I cut Merry Christmas out of cardstock that was printed on my laser printer. Make holes in cardboard circle to mount lights. I used a 5/16th inch drill to make the holes (35 of them), and then pushed into place, the lights are held tight by friction. 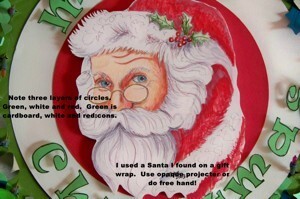 Make white and red circles from construction paper. They are 2 or 3 inches smaller than preceding circle. Print Merry Christmas on cardstock with font of your choice. The letters are placed and attached with small pieces of cardstock, 1in. by 3/8 in. Fold in half, and glue one end to paper circle, and one end to letter. Hang in location of your choice. If outside, secure tightly to avoid wind damage. Battery operated lights are available at the craft stores.